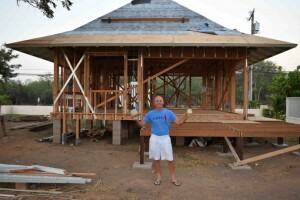 The Maui Hemp Institute for Research & Innovation Organizing Committee invites the public to a free open house in Kīhei on Sunday, June 7, showcasing Maui’s first home built with hemp construction materials. Homeowners Don and Joy Nelson, and Lee McBride will host public viewings of their hemp ʻohana from noon to 2 p.m., and answer questions with the home’s builder and Architect George Rixey. The open house is one of many events throughout the state being organized by the committee to celebrate the 6th Annual Hemp History Week, a national grassroots education campaign. Hemp week, celebrated from June 1 to 7 this year, is held to help renew strong support for hemp farming in the US. Local hemp advocates Simon Russell, vice-president of Hawaiʻi Farmers Union United, and Denise Key, director of ihempHI.com, will also be available for interviews and discussion. Light refreshments provided by Whole Foods Market and Manitoba Harvest will be served, and free hemp product samples from Dr. Bronner’s will be distributed to attendees. Hemp History Week will feature a national retailer program with over 1,000 participating stores, local events, restaurant participants and hemp product sampling. The campaign will also feature a Take Action petition drive to encourage the Obama Administration and Congress to change federal policy and allow American farmers to once again grow industrial hemp. The hemp ohana is located next to Sugar Beach Events Villa, 101 N. Kīhei Road. For more information about Hemp History Week, go online . For more information about the Hemp Industries Association, go online . For more information about Vote Hemp, go online .